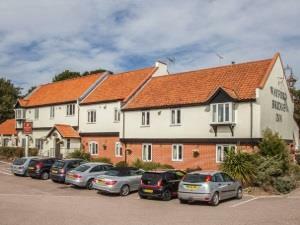 Wayford Bridge Inn01692 582414work InnThe Wayford Bridge Inn is located in the Norfolk Broads is within reach of Norwich, Great Yarmouth and the delightful Norfolk Coast. Dating in parts from the 17th century, the hotel fronts onto the picturesque River Ant, beside the ancient crossing point at Wayford Bridge. Offering a tranquil location for holidaymakers and business travellers alike, many rooms offer attractive views of the river and its beautiful surroundings. Relax in our warm comfy lounges or in the restaurant, where a variety of traditional cuisine is on offer. During the warmer months our large terrace offers the ideal place to watch the world go by. The Wayford Bridge Inn is located in the Norfolk Broads is within reach of Norwich, Great Yarmouth and the delightful Norfolk Coast.